National Guard members must prevent attempts by Russia to disrupt presidential elections in Ukraine, President Petro Poroshenko has said. "My first duty as president, as supreme commander, as a guarantor of constitutional rights and freedoms of citizens is to protect the will of the Ukrainian people, and your duty, military men and patriots, is to prevent attempts to disrupt the elections. 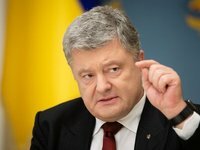 The President of Ukraine will be elected by the Ukrainian people and we will do everything, so that it is transparent, in accordance with the law," Poroshenko said at the international interdepartmental multidisciplinary National Guard training center in Kyiv region on Tuesday. Poroshenko said Russian authorities want to use the elections to destabilize the situation in Ukraine. "[Russian President Vladimir] Putin is not going to leave us alone. These days we see signs that the Kremlin wants to use the elections to destabilize the situation in Ukraine. This is not only about interference in the elections to ensure that victory for pro-Moscow candidates, it is about implementing a whole plan for disrupting the elections, turning it into an domestic conflict," he said. The first round of Ukraine's presidential elections will be held on Sunday, March 31, 2019.